Bring the cream to the boil in a small saucepan. Remove from the heat, stir in the white chocolate and butter and allow to melt. Tip the mixture into a bowl and stir in the rose extract and Yotti’s Rose Turkish Delight. Stir well and chill for several hours until firm. Roll teaspoonfuls of the mixture into balls and place on a plate. Return to the fridge for at least an hour. Line a baking sheet with parchment. Break the plain milk chocolate into pieces and melt in a bowl over a pan of barely simmering water. Dip each truffle into the chocolate. Use a fork to remove from the bowl (allowing excess chocolate to drip into the bowl) and place on the parchment. 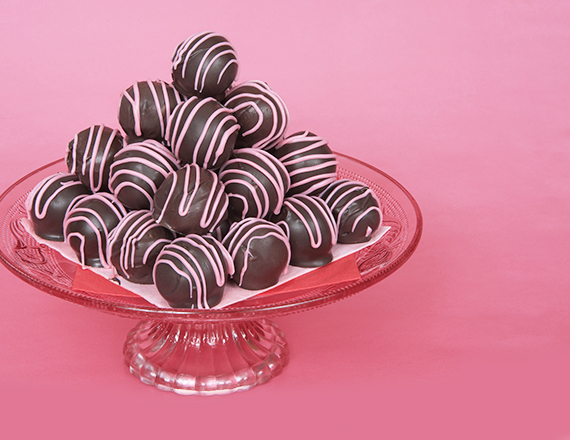 Drizzle the white chocolate over the truffle, in any pattern you choose. Leave to cool or chill until set. Store in a cool place and eat within a week.